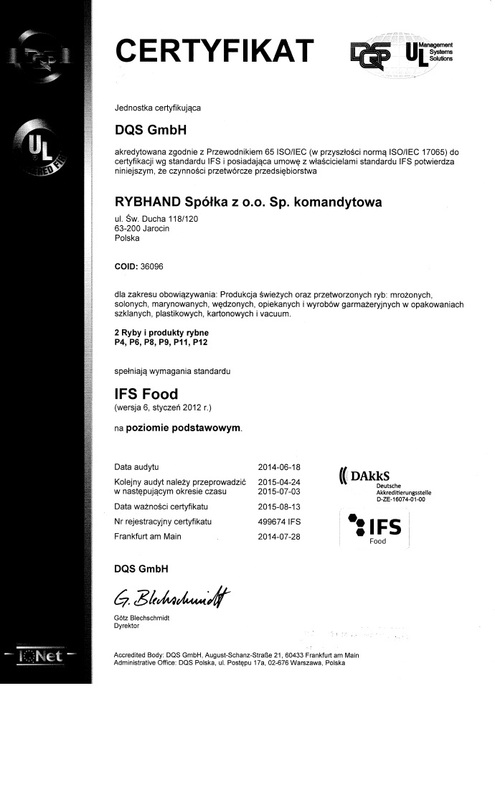 Rybhand company was founded in 1991 as a small smokehouse located near the owner’s – Elżbieta and Leszek Trzcieliński`s house. What at the beginning was a small manufacture, evolved into a modern seafood processing and import/export company. 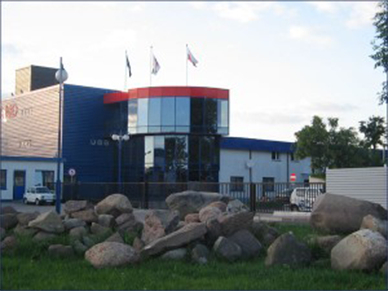 The main branch of the company’s activity is pelagic fish processing such as herring and mackerel. They are used for the production of salinities, marinates, smoked products and ready-to-cook food. Fresh and frozen white fish – fillets and carcasses are extremely important part of the production and of the company’s offer. 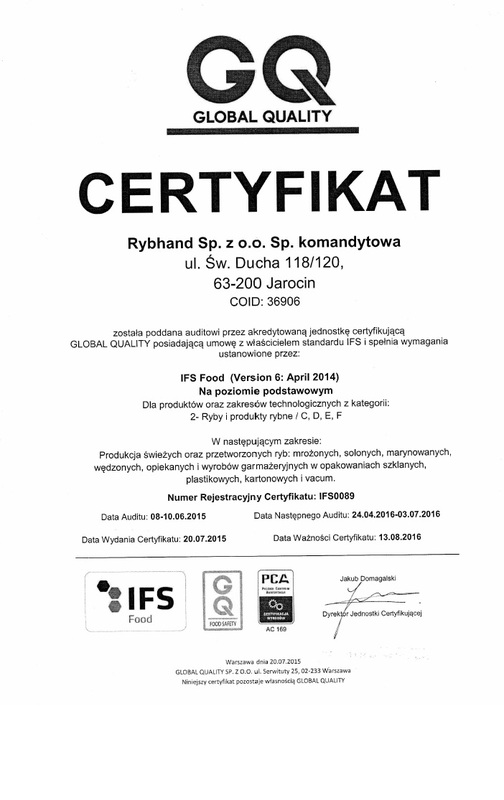 After more than 20 years of operation Rybhand is one of the most dynamic and flexible companies of the seafood processing sector in Poland. 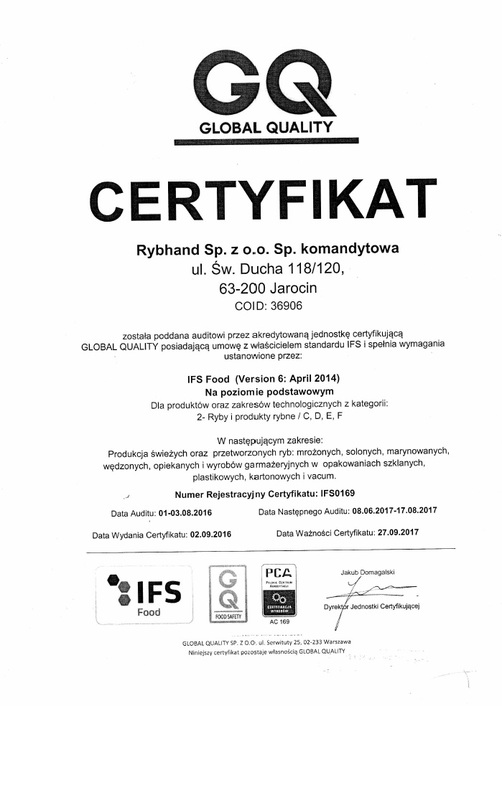 Rybhand`s company products are appreciated for their taste and smell qualities, what can be confirmed by long lasting cooperation with merchandise chains in Poland and abroad. With its strong foundations in long tradition but with introducing new solutions Rybhand constantly proves that high quality does not mean high prices. The seafood resources are imported from e.g. USA, Iceland, Norway, Greenland, Faroe Islands, Great Britain, Netherlands, Peru, Argentina, Chile, Spain, China, Vietnam, Australia or New Zealand. Presence of Rybhand`s representatives at the majority of the biggest seafood fairs in the world such as European Seafood Exposition in Brussels, International Boston Seafood Show/Seafood Processing America Boston, Fish International Bremen or Polfish Gdańsk, gives an enormous opportunity for constant pursuit of the best quality seafood resources and for introducing the company to the global market. The company owns cold stores, freezing facilities and state of the art production supply base, which allows to produce the top quality products. The resources import, merchandise and products distribution is carried out using the company’s vehicle fleet with different capacity or in cooperation with transport companies which allows to support customers in the whole area of the country. 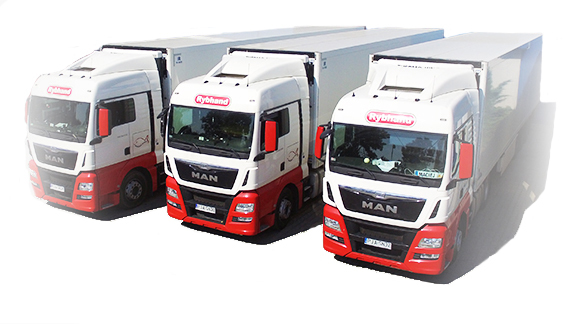 Rybhand`s company products are exported to Germany, Czech Republic, Russia, England, Ireland, Afghanistan and UAE. 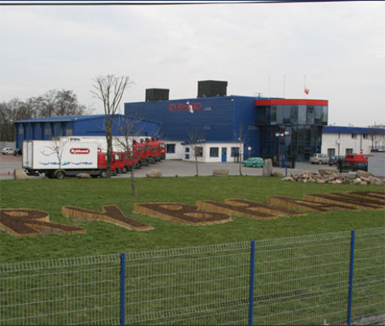 The headquarters, production and distribution facilities of the company are located in Jarocin (Poland). The effective sales is carried out by the branches located in Poznan, Kalisz, Szczecin, Piekary Śląskie, Katowice and Podczel near Kołobrzeg. RYBHAND, posiadając nowoczesną i zróżnicowaną pod względem ładowności flotę pojazdów firmowych oraz przy współpracy z wiodącymi firmami spedycyjnymi, jest w stanie dostarczyć produkty świeże i mrożone do każdego miejsca w Polsce. Rybhand dowozi pod wskazany adres zamówienia o dowolnej wielkości, minimum logistyczne określane jest na podstawie odległości do odbiorcy. Zarówno transport całopojazdowy, jak i drobnicowy jest monitorowany na każdym etapie wykonywania zlecenia. Dostawy produktów świeżych i mrożonych na terenie Polski do odbiorców detalicznych, hurtowych i sieciowych realizowane są zazwyczaj w ciągu 72 godzin. Dostawy produktów świeżych, wymagających kontrolowanej temperatury od +2 do +6 st. C, przy minimum logistycznym jedna paleta, realizowane są w ciągu 48 godzin. Dostawy za granicę, m. in. do Niemiec, Czech, Rosji, Irlandii, Anglii, Szkocji, Afganistanu lub Emiratów Arabskich ustalane są indywidualnie z odbiorcami.